Many sales professionals rely on their talent and work ethic to help them succeed. They believe that if they go more and do more, they’ll achieve greater returns. They fail to realize that strategy is the key to real growth. 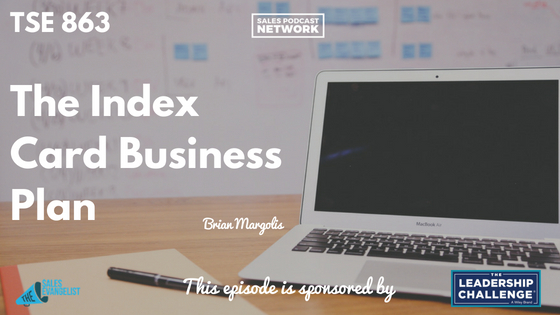 Brian Margolis, the author of The Index Card Business Plan for Sales Pros and Entrepreneurs, has developed a unique index card business plan to improve strategy. On today’s episode of The Sales Evangelist, we talk with. Brian’s understanding of strategy helps sales pros apply all of their knowledge and skill to move their business to the next level. Pillars are the activity you have to complete every week that is 100 percent in your control. Pillars must be proactive. They must be significant to your income and your productivity, but pillars do not have immediate consequences. Prospecting, for example, is significant to your business, but your next paycheck won’t be immediately impacted by your failure to prospect. Pillars must be high-leverage activities that produce big results. They must also be predictable or repeatable, such as reaching out to a certain number of prospects each week. Pillars are something you already know how to do effectively, but that doesn’t mean you shouldn’t tackle new ideas. If, for example, you could use help with prospecting, your pillar would be to spend an hour a week studying prospecting. Because you already know how to learn, the pillar activity is the learning. Pillars must be measurably weekly so that you can cross it off your list at some point. They also must be things that aren’t already habits. Begin by identifying one thing you already do effectively that could increase your business if you did it more. The answers will lead you to your pillars. Perhaps you need to increase your followup; generate more prospects; create more content. Whatever they are, choose the skills that would impact your business if you improved them. For example, if I take the time to create a Hitlist of my best prospects each week, my prospecting would improve because I’d be focused on the right people. Schedule 15 future meetings each week; 7 of those must be million dollar meetings. Send five non-sale touches each week to nurture existing relationships. Complete three workouts a week. Pillars can help you master the mundane: the things you know you should do but that you avoid. If we invested time doing them instead of seeking silver bullets to help us avoid them, we would likely see results. Being good at something doesn’t guarantee success. You must have a strategy. The index card business plan can help. Grab a copy of Brian’s book, The Index Card Business Plan for Sales Pros and Entrepreneurs. It’s a guide to help overwhelmed sales professionals stop being reactive, and instead develop strategies to move their business to the next level. It will help you channel your existing skills into an actual strategy, and to help you synthesize your existing knowledge. Connect with Brian on LinkedIn or on his website productivitygiant.com, and grab a copy of his free report on simplifying your own strategy. Consider giving a copy of the book Stop Selling & Start Leading as a thank you gift to someone who provided a referral. It’s a blueprint for sellers based upon years of research about the things buyers hate. 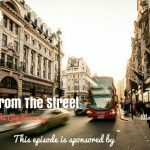 We’re so convinced that you’ll love the book that we’re providing a free excerpt to our listeners here. 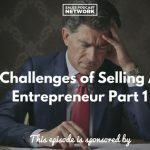 The Sales Evangelist Hustler’s League is an online coaching program designed to help sellers of all levels and all industries improve. It’s an opportunity to share ideas and interact with other sellers from around the world. Also check out The Sales Evangelizers on Facebook, where a community of people shares their struggles and their experiences with selling.